This weekend I was in the city I grew up in visiting some old friends. On Saturday, I went to the park with my friend Kathy and her son, Jack, who is not quite two and a half. The park is just a large area of lawn behind a suburban neighborhood with trees on either side and a highway a couple hundred yards away at the back. "What's the furthest you've ever been from your son?" I asked her. "Not when someone else is watching him, but when it's just you and him." "I don't know," she said, and thought to herself. "Maybe in the house somewhere? He'll be in one room and I'll briefly go to another room. Or to check the mail maybe?" "What about when you're out somewhere," I asked. "How far away are you comfortable letting him go?" "Not at all far. At the zoo once he wandered maybe 20 feet from where I was and I freaked out." "That's understandable," I said. "It's a zoo. There are animals and strangers and other things to be worried about. But what about here? There's no one else around. The trees are far away, the road is far away. Any idea how far you'd feel comfortable letting him get away from you?" "I don't really know," she said. "Let's try something," I said. "Take this." I gave her a small gift-card sized envelope to put in her pocket. "Come stand with me at this tree. Let's have Jack run across the park. At some point he's going to be at a distance where you need to run after him. You may want to before that point, but I want you to wait until you need to go after him. Okay? We don't know when that will be. It's certainly not going to be when he's two feet away. And it's not going to be when he's about to go into the street. But somewhere in the middle you'll feel that compulsion to go after him. Are you okay with this?" She agreed. Yes, it was a weird request on my part, but it didn't seem overly dangerous. It was just grass all around us, the street was a long ways off. And she's young and in shape and can easily catch up to a toddler. "Once you meet up with him, just stay where you are and I'll catch up with you." We got down on the ground and I tried to convey to Jack that we wanted him to run as fast as he could across the park. Jack was into the idea and raring to go. "Ok, Jack. Go!" I said and set him free. He ran as fast as his legs would take him. Kathy felt an immediate urge to go after him within 15-20 feet but held herself back and just watched for a little bit. Jack became smaller and smaller. He stumbled a couple times, but nothing serious. I could tell the tension was building with Kathy. He was still some distance from anything that could cause him harm, but I could tell the distance itself was becoming overwhelming for Kathy and eventually she tore off after him. I caught up with them a few moments after that. She was on her knees hugging him. I looked back at the tree where we started. "How far do you think that is?" I asked. Neither of us had any real clue. "Let's count it off," I said. We walked back to the tree with me stepping heel to toe and her counting off steps. We were estimating that each step was about 1 foot (i.e. 12 inches, for my non-Imperial system readers). When we got back to the tree we were at 171 feet. "Interesting," I said. "Can I get that envelope I gave you?" "Impressive, right?" I said. "Here, I'll tell you how it's done. If he had run into the road, I would simply have covered up the n't in didn't with my finger so it says, 'He did run into the road and get hit by a car.' Simple!" "Okay, I admit, that's not that great of a trick. This isn't my prediction, it's another envelope." I opened the envelope I was holding and removed a small folded card half-way. I offered it to her to take out the card. On the outside of the card was a picture of Jack I had taken the day before. It was a close-up of his face and he was giving the camera a sideways glance and funny smile that made him look like some old Vaudevillian comedian. And here come the tears and the cooing and the hugging. A thumb-writer/nail-writer/swami/boon or whatever you use for secret writing. And the set-up I first wrote up in the JAMM #10 which allows you to thumb-write on the inside of a folded piece of paper that's in a small envelope. The method is the simple part. In fact, it's pretty much the same as the method mentalists use all the time to predict a random number. Gee... great. A random number, a random word, a random time of day. "Well, predicting random numbers was good enough for [Insert Mentalist's Name] so it's good enough for me." Hey, I hear ya, and that's fine by me. I'm not trying to change anyone's mind. You do you. On Monday I wrote that predicting or divining "random" things means losing the opportunity to imbue an emotionally relevant element into an effect. And I wrote how I was getting much stronger reactions when making the "unknown personal" central to the effect. This trick is my favorite type of unknown personal because not only are you predicting something there's no way you could know or research about a person. You're predicting something that is both wildly personal but also completely unknown to even the person themselves. They don't know at what distance they'll feel physically unable to be apart from their child. They've probably never really thought about it, but it's still somehow fundamental to the nature of their relationship with the child. I have to give 100% credit for the idea behind this trick to the artist Lenka Clayton who, six years ago, did a series of these experiments with her own son, seeing how far apart she could be from him in different situations. I just saw the videos recently and I thought they'd make a perfect starting off point for an effect with strong emotional elements. The videos are intriguing, funny, tense, and heartwarming. I knew it would be interesting for people to experience that themselves. When Kathy asked me later on how I could know, I just deflected. I told her I had talked with her son the previous day. 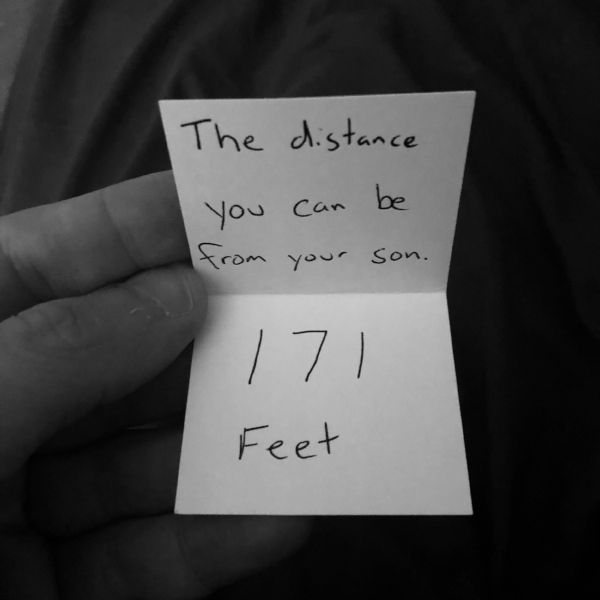 I showed him how long a foot was and asked him about how many of them away he felt he could be before he needed his mommy and he told me 171.